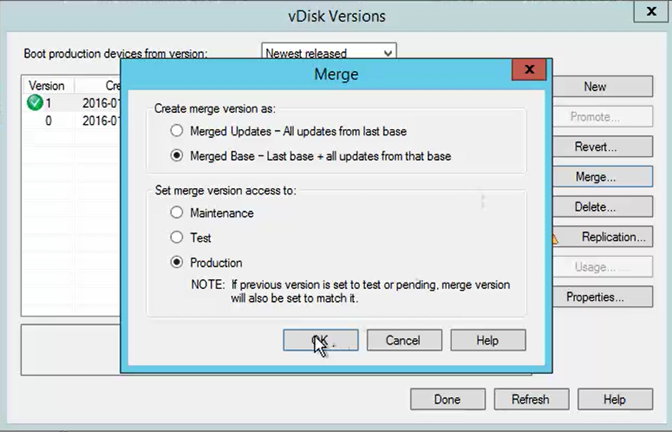 A couple years ago I was troubleshooting through a Versioning and Merge VHD issue with Provisioning Services (PVS) 7.1 and Windows Scale-Out File Server (SOFS), which resulted in my recommendation to create a Maintenance store for vDisk Versioning. I am happy to see in the last two years this has completely improved and dare I say is fully resolved, specifically with the recent release of PVS 7.7. 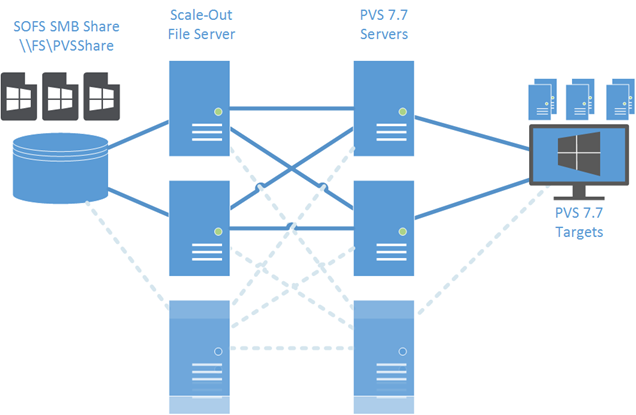 In this blog post, I’m going to share a little bit of testing data from my experience with PVS 7.7, along with a couple recommendations. Let’s get started! 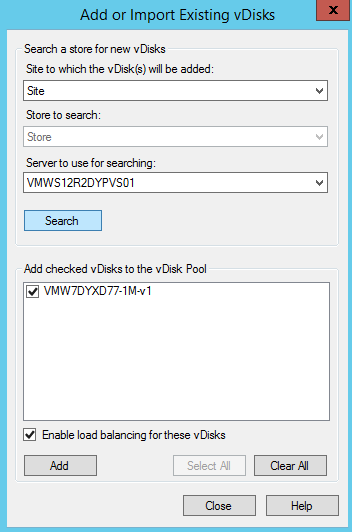 Streaming VHDX formatted disks. 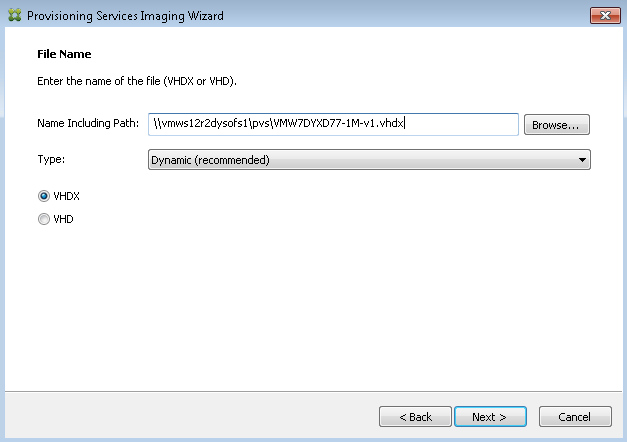 This feature adds flexibility and efficiency to image and merging operations by letting you stream VHDX files as well as VHD files. 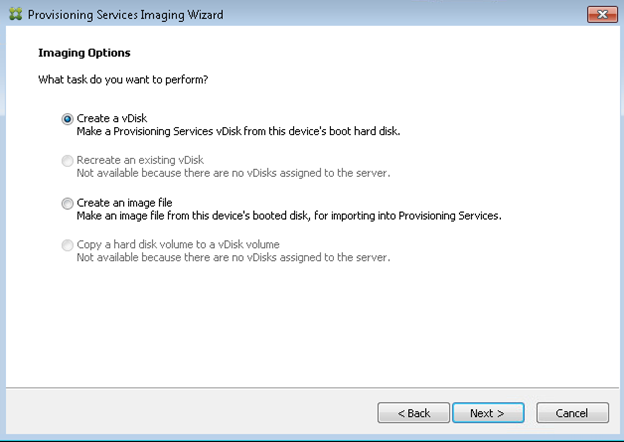 Provisioning Services recognizes and uses the file format .vhdx as the extension for base disks and .avhdx for differencing disks (also known as versions). No configuration of this feature is necessary. 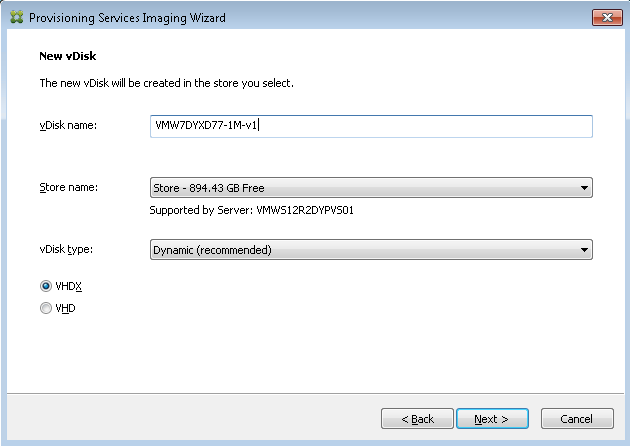 You perform all image manipulation functions, such as deleting or merging vDisks, or creating new versions, in the Provisioning Services console the same way for both formats. The in-place upgrading feature is fantastic, and I wanted to call that out before moving on. I won’t be showing any test data from that feature, but my experience with it so far has been fantastic! For performance testing and results, I’m going to be sharing PVS 7.6 vs. 7.7 and VHD vs. VHDX during image capturing and Versioning merging. 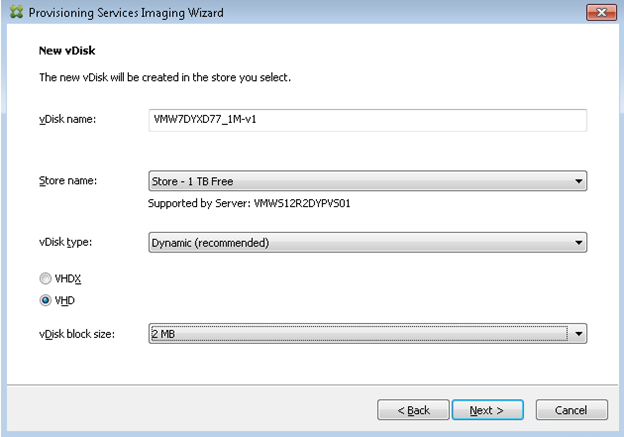 The other capability that should be called out as a specific feature of what’s new in PVS 7.7 is the Target Image Creation Wizard and new option to create an image file. 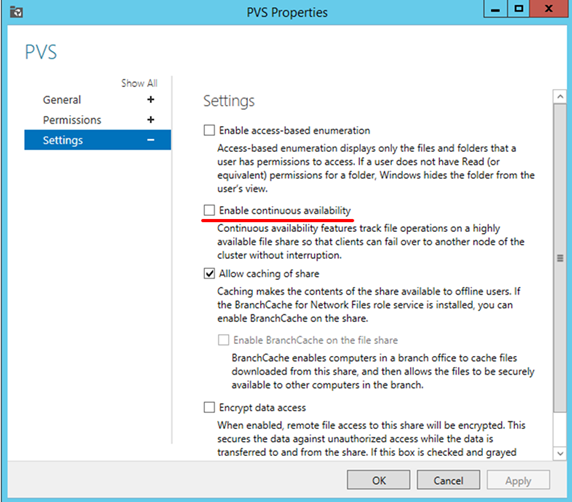 This feature allows you to capture directly to a local disk or file share to import directly into PVS. This is actually pretty huge from an admin experience perspective, so I’m not sure why the PVS team didn’t feel this should be called out. Windows 7 64-bit vanilla gold image (non-optimized) Master VM for capturing. Windows installed, but no applications or updates. Roughly 20GB thin provisioned size. You can see from the baseline, I’m getting 255 MB/s of throughput to the SMB share (2+Gb/s). This is really good performance, so suffice to say there is no storage bottleneck for the SMB share. 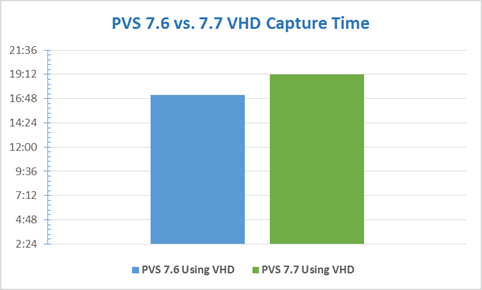 As you can see from the visual above, PVS 7.6 was slightly faster than 7.7 in a capture to VHD test (roughly two minutes faster). 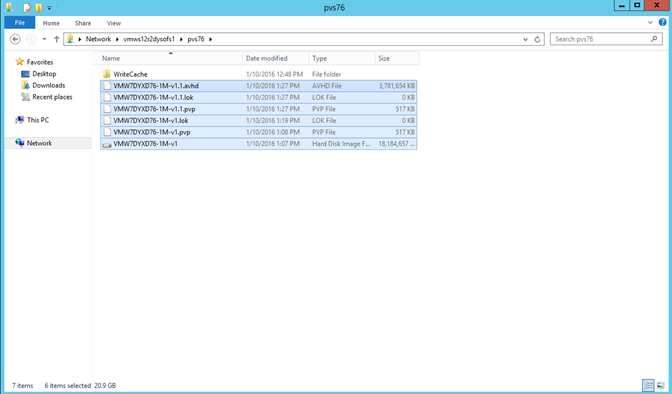 For the PVS 7.7 Target, I selected the following options to capture a VHD. 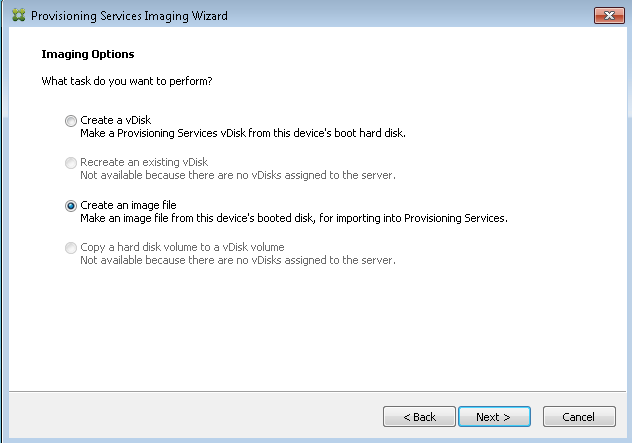 Selected “Create a vDisk” which connects to the PVS server and streams the C:\ drive through the PVS server to create the vDisk (legacy scenario). You’ll also notice the new option, Create an image file. We’ll come back to that. 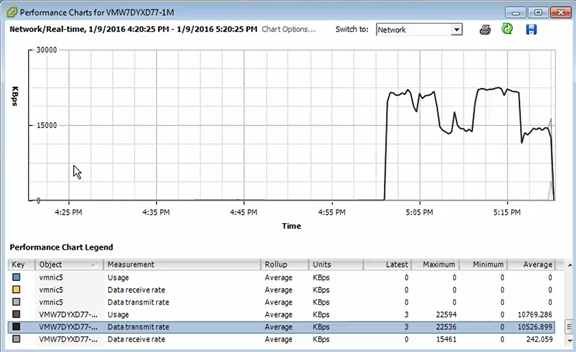 Based on this network performance data, it makes sense why PVS 7.6 was slightly faster for capture. I didn’t re-run this test multiple times to see if the results were similar after multiple runs, this is just a single data point. 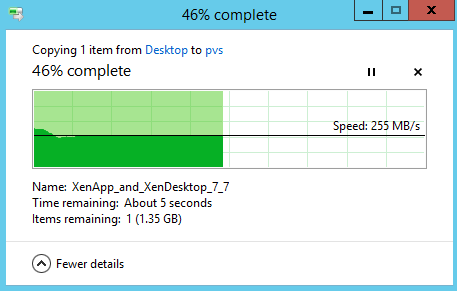 Looking at some of the vSphere VM performance data, the PVS 7.7 VHDX Target was typically hovering at 30-35MB/s. 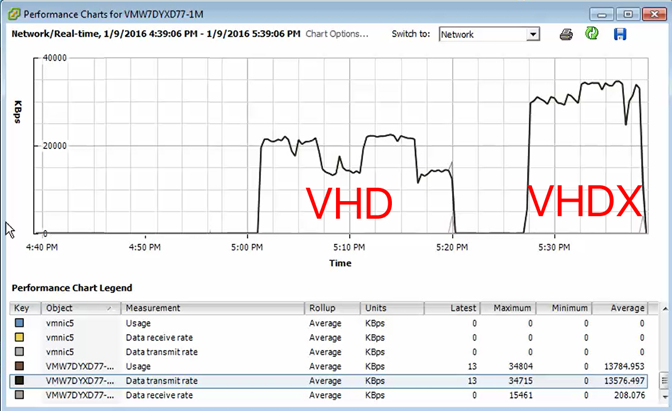 The visual below shows PVS 7.7VHD and VHDX capture network data side-by-side. 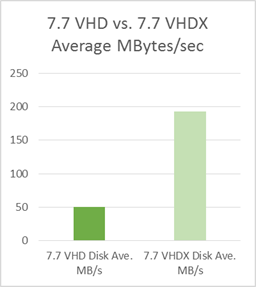 Looking at some of the vSphere VM performance data, the PVS 7.7 VHDX Target peaked to almost 200 MB/s during the capture (10X the throughput compared to VHD capture through PVS server). 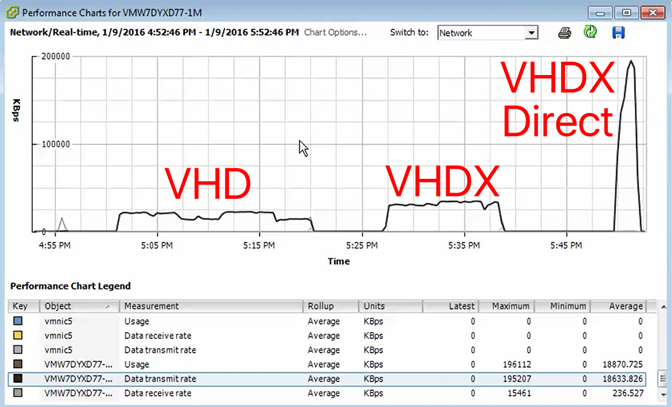 The visual below shows PVS 7.7 VHD, VHDX, and VHDX Direct to SMB share network data side-by-side. For the next set of tests, I’ll show a couple comparisons of VHD Merge operations compared to VHDX, using the SOFS SMB share. 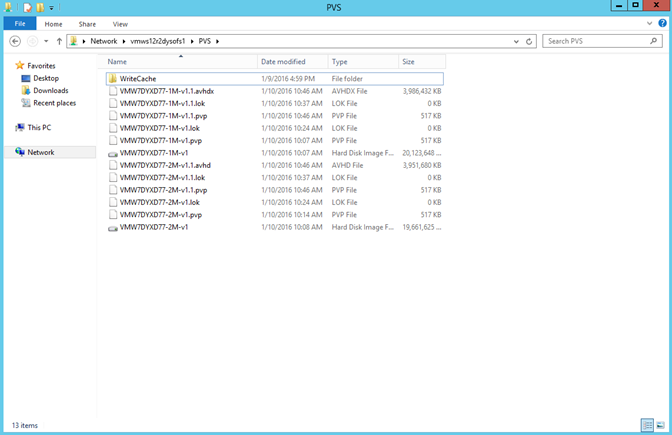 For this test, I took my vanilla vDisk for PVS 7.6 (VHD only) and PVS 7.7 (VHD and VHDX), created a new Version and installed Microsoft Office 2013. The results would probably be exponentially better for merging multiple versions into the base, but a single diff (avhd vs. avhdx) is an easy to reproduce testing scenario. 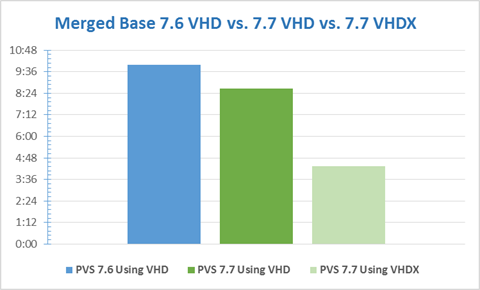 As you can see from this visual, merging a 20GB base with a 4GB delta is half the time comparing PVS 7.6 VHD to PVS 7.7 VHDX. Also, it’s safe to say with this type of network/disk performance using PVS over a Scale-Out File Server SMB share is absolutely acceptable for a production environment. While my previous recommendation was to use a Maintenance Store when using PVS with SOFS, that’s definitely no longer a requirement. 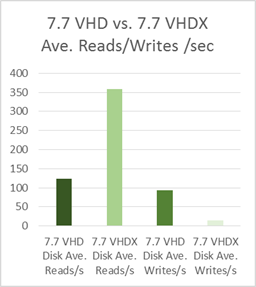 One additional factor that I evaluated for this test was disk/storage impact during merge operations, comparing PVS 7.7 VHD to PVS 7.7 VHDX. 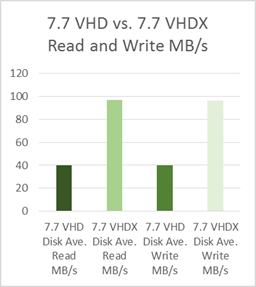 VHDX performance was significantly better due to the 1MB alignment for VHDX vs. VHD which is not boundary aligned. 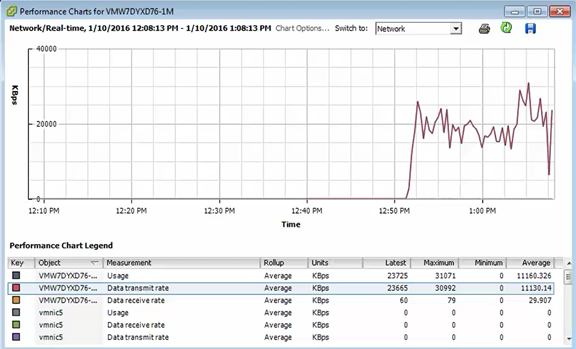 Watching Perfmon on the SOFS nodes, the following disk performance results were observed. 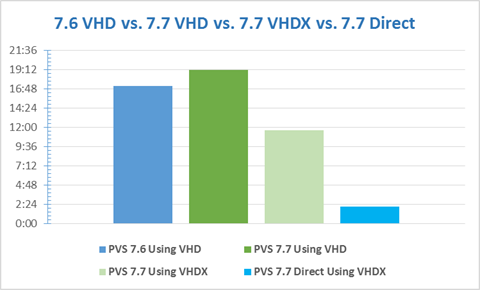 Additionally, testing results in this blog post should have you convinced that the default VHDX format for PVS 7.7 vDisks should definitely be used moving forward! 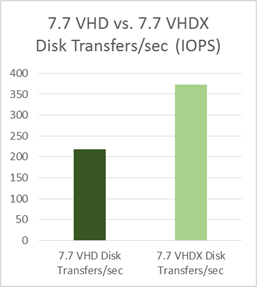 If you have a bunch of legacy PVS VHD formatted vDisks, you may have to debate converting these to VHDX to benefit from these dramatic performance improvements. Congratulations to the PVS team in delivering a fantastic release with phenomenal performance improvements for basic admin operations. 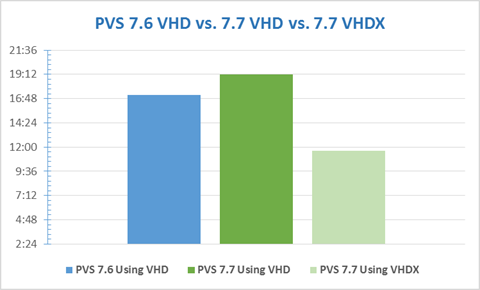 I’m really happy with all the results I’m seeing comparing PVS 7.6 to PVS 7.7, and hope to see broad adoption of VHDX. Additionally, the ability to capture locally or directly to a file or SOFS SMB share is definitely going to be leveraged for my deployments moving forward. Leave a Reply to Erik-jan Click here to cancel reply.